The Mini Skip is ideal for Household, Garden and DIY projects. This Skip can hold roughly up to 20 black refuse bags. Due to its size it is perfect for when space is an issue and will fit in 99% of driveways. Our mini skip can hold between 20 and 30 black bags and is mainly used by customers for their small house or garden jobs. This is one of our most popular products for residential customers because of its small size and large capacity. This small skip is just the thing for all your small projects. Whether you’re having a clear out or doing your back garden, you’ll find plenty of room in this 2.5-yard skip. Sometimes you just don’t have enough to fill a standard sized skip but a little too much for a skip bag and this is where the mini comes it. The mini is 2.5 cubic yards and offers enough room for all your small projects and yet it still won’t take up a lot of room. It’s convenient and small enough to fit on any driveway. 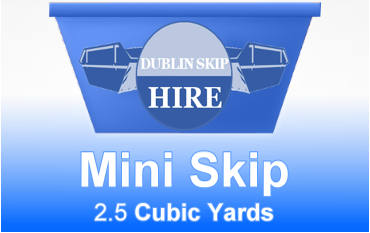 Contact one of our expert staff now to order your mini skip from Dublin Skip Hire. We deliver throughout the country and can arrange a delivery time that suits you. Call the office now or use the order button on the website and we will be in touch.